Like so many of those before me, I learned the ropes of storm chasing under the tutelage of some then-new friends in the hobby. Tens of thousands of miles and over a decade later, those new friends are now old friends, and my passion for chasing has remained, unwavering, despite the daily grind that chasing brings along with it. I was born in Canton, Ill., and I’ve lived here my whole life, save for my four years at Knox College in Galesburg – just an hour up the road. It’s become a cliché, but I’d be lying if I weren’t admitting it – the movie Twister was my first real memory of wanting to chase storms. I was glued to that movie screen, and my mother has only herself to blame for taking her young son to the movie theater back in 1995. 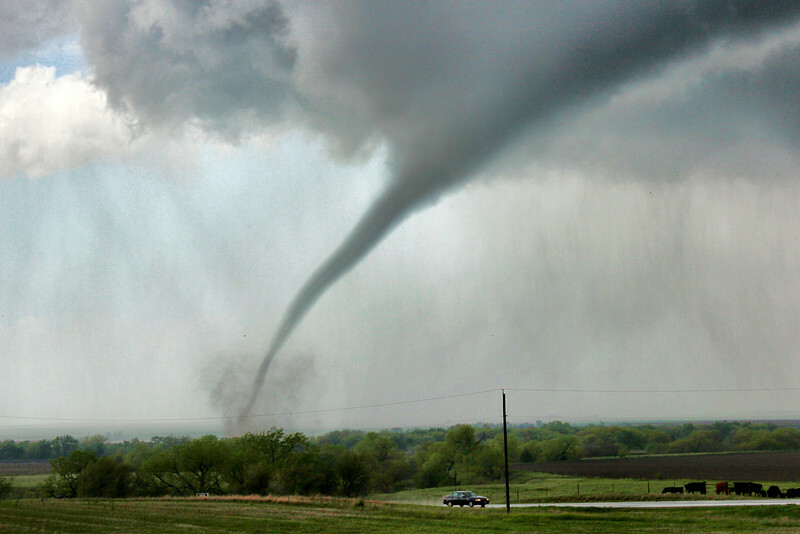 April 19, 1996 brought one of the largest tornado outbreaks in Illinois history, and I saw my first tornado – and several thereafter – that night in the fields south of my best friend’s house. I learned as much as possible about the Tri-State Tornado of 1925, the April 26, 1991 Kansas/Oklahoma outbreak, and even the tornado that devastated my hometown on July 23, 1975. The names of people such as Howie Bluestein, Tom Grazulis, Ted Fujita, Warren Faidley, Tim Marshall, Chuck Doswell and the late Jim Leonard and Al Moller became like those of sports heroes to me – even at a time when my Chicago Bulls were dominating the NBA scene and my Chicago Cubs still stunk up the joint. My first local storm chases were back in 2002, going out in my early teenage years (with a family friend who shared the interest) and often caravanning with some of those aforementioned friends. My boundaries were generally, though not always, confined to Western and Central Illinois in those days. But my range quickly grew along with my maturity and experience; my first trip to the Plains came in 2003 on an early-season bust. My first “chasing” tornado came not much after that, though, on an LP-classic hybrid supercell in Northwest Illinois on April 30, 2003. Since then, I’ve been fortunate to have documented such events as the Glen Elder, Kan. tornadoes of 2008, the Wakita, Okla. tornado of 2010 and the Langley/Great Bend, Kan. tornadoes of 2012. Over the years, I’ve made dozens of trips back to the Plains and scores of chases closer to home, and each time I come away marveling at new experiences, new sights, new feelings. I’ve chased in 15 states over the years, and I’ve come to the point that chasing, like nature photography, is my way of being at one with nature. I enjoy the challenge of forecasting the worst possible conditions, then capturing the best possible photographs under those conditions. Though not my area of study, I was classically trained as a photographer during my years at Knox. It’s a hobby that goes hand-in-hand with chasing. I even see myself more as an atmospheric photographer than a storm chaser these days, but you still have to be in the right place at the right moment. That’s the storm chasing part. I was actually a political science major in college – double-minoring in history and journalism. I played on the baseball team and had a pitching career I’m quite proud of. I still play on Sunday afternoons in the summer, and I will until my arm will no longer revolve. I live with my girlfriend-since-college-friend-since-high-school (now fiancée), our two cats and our rescued German shepherd. Currently (March 2016), I'm completing my thesis for my Master’s degree in Political Management from The George Washington University in Washington, D.C.
And, yes, I still passionately follow the Chicago Bulls and Chicago Cubs. I’ve learned that being a Cub fan and a storm chaser are quite similar. Every year, in September, I tell myself the same thing. For work, I’m the Foundation Director at Spoon River College – an absolute dream job that allows me to use my skills, education and experience to make a difference in many lives right here in my hometown. Prior to this “job,” I’ve worked/run political campaigns most of my professional life – a job I love doing both because politics is another passion of mine and because of the people I get to meet along the way. I also teach politics and government at SRC, and I assist in coaching baseball at the varsity level at CHS. Spring is a busy time of year for me. Much to the dismay of my checking account, I seem to choose expensive hobbies. But, the reason I enjoy storm chasing so much is because it melds so many of my passions together – constant learning, nature’s beauty and power, photography, traveling, reuniting with old friends, meeting new people and learning their stories. Now, you know my story. And, since you stopped by, I hope that you'll drop me a line so that I can begin to learn yours. It's my competitive drive and desire to learn and continue learning that keeps me endlessly chasing the point where the sky meets the ground – that naked perfection you feel when it's just you and the elements; that flawless photograph that always seems to elude you; the answers to questions that never seem to stop coming. I’m enough of a perfectionist to know that the flawless photograph doesn't exist, and I'm not arrogant enough to believe that those answers will ever fully come to me. But, I'm stubborn enough that I'll probably never end either pursuit. The good news is that, due to my nature as a teacher and a coach, and out of respect for the thousands who have taught me so much, the chances are good that, as I learn those answers, you can bet I'll be willing to share as much as possible. When the time comes, I’ll let you know.